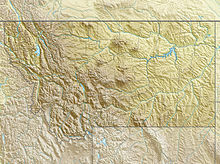 Bozeman Yellowstone International Airport (IATA: BZN, ICAO: KBZN, FAA LID: BZN) (Gallatin Field) is located in Belgrade eight miles (13 km) northwest of Bozeman, in Gallatin County, Montana. Owned by the Gallatin Airport Authority, the airport became the busiest airport in Montana in 2013. The National Plan of Integrated Airport Systems for 2011–2015 categorized it as a primary commercial service facility (more than 10,000 enplanements per year). Federal Aviation Administration records show that the airport had 442,788 passenger boardings (enplanements) in calendar year 2013, 434,038 in 2012 and 397,870 in 2011. In 2011 a terminal expansion designed by Prugh & Lenon Architects opened, adding three gates and more retail concessions. The firm designed expansions and renovations made in 1995 and 1997. Gallatin Field was renamed Bozeman Yellowstone International Airport in late 2011 to associate it with Yellowstone National Park. International flights have been allowed since 2012, after a U.S. Customs and Border Protection facility opened on July 1. The project was funded in cooperation with Signature Flight Support and the Yellowstone Club. In 2013, BZN surpassed Billings as the busiest airport in Montana for passenger service with 879,221 passengers from June 2012 to May 2013. 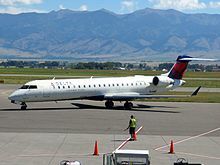 A Delta Connection CRJ700 on the tarmac, with the Bridger Mountains in the background. 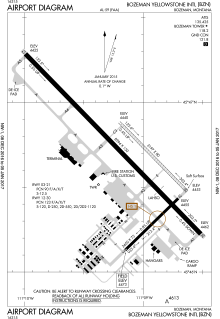 The airport covers 2,481 acres (10.04 km2) at an elevation of 4,473 feet (1,363 m) above sea level. It has three runways: 12/30 is 8,994 by 150 feet (2,741 by 46 m) asphalt; 3/21 is 2,650 by 75 feet (808 by 23 m) asphalt; 11/29 is 3,197 by 80 feet (974 by 24 m) turf. In 2017 the airport had 76,223 aircraft operations, average 209 per day.General aviation accounts for 73% of operations. air carrier account for 15%, air taxi 12% and military <1%. At the time there was 359 aircraft based at BZN, 260 single engine, 24 multi engine, 41 jet, 23 helicopters and 11 gliders. ^ a b c d FAA Airport Master Record for BZN (Form 5010 PDF). Federal Aviation Administration. effective April 5, 2012. ^ Hausen, Jodi (June 18, 2013). "Bozeman airport busiest in state". Bozeman Daily Chronicle. Retrieved 9 April 2017. ^ "2011–2015 NPIAS Report, Appendix A" (PDF). National Plan of Integrated Airport Systems. Federal Aviation Administration. October 4, 2010. Archived from the original (PDF, 2.03 MB) on 2012-09-27. ^ "Enplanements for CY 2013" (PDF). Federal Aviation Administration. June 20, 2014. Archived from the original (PDF, 1.0 MB) on 2014-08-16. ^ "Enplanements for CY 2012" (PDF, 189 KB). Federal Aviation Administration. 2013-10-30. ^ a b "Bozeman Yellowstone International Airport BZN - Yellowstone Flights". www.bozemanairport.com. ^ Bacaj, Jason (December 9, 2011). "Gallatin Airport Authority approves airport name change". Bozeman Daily Chronicle. Retrieved September 20, 2014. ^ "Portland, Oregon Non-Stop Service Now Daily Year-Round On Alaska Airlines - Bozeman Yellowstone International Airport". bozemanairport.com. ^ "Info" (PDF). bozemanairport.com. 2017. ^ a b "Book a Flight : Best Fare Guarantee on Airline Tickets : Delta Air Lines®". www.delta.com. ^ "JetBlue adds three new cities in West, but trims at Long Beach". ^ "OST_R | BTS | Transtats". Transtats.bts.gov. Retrieved 2018-07-25.